Membership is free. There is no fee or registration process to become a member of the Administrative Consultants Association. We take an unconventional approach to membership. If what we stand for resonates with you, represents what you are in business to do, and you would be proud to be a part of our tribe, simply place one of the membership buttons below on your website. It’s as simple as that! To place the Administrative Consultants membership button on your website, simply copy the code inside the text box below the membership seal you wish to place on your site, and paste it into the HTML of the page where you’d like it to appear. Each button is in .png format with a fully transparent background so that it displays crisply and cleanly on your website. The link to our site is set to open in a new window so your site visitors will never be taken away from your website. Our only requirement for displaying our membership button on your site is that you follow these instructions explicitly. The link and alt text must remain intact and unchanged. Administrative Consultants, display the ACA Code of Ethics badge on your website to demonstrate to clients your commitment to the highest standards of honor, integrity and excellence in business. Click here to read and take the pledge. To place the Administrative Consultants Ethics Pledge badge on your website, simply copy the code inside the text box below the seal you wish to place on your site, and paste it into the HTML of the page where you’d like it to appear. If you struggle with articulating your value to clients, let us help do some of the work for you! Feel free to place this educational video on your website to help explain to prospective clients how you help them and the benefits of working with you. Did you know that the ACA provides a client guide that you can use? Yup, we do! It’s called the Client’s Guide to Administrative Consultants. I know there are lots of Administrative Consultants out there who are absolutely experts at what they do, but who sometimes feel they need a little extra help articulating their value to clients. This guide gives you another resource that you can point clients to that will help educate them and set their expectations so the relationship can get off to the best possible start. Take a minute to read through the guide yourself. 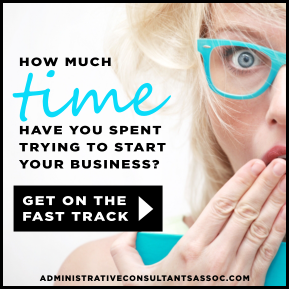 You’ll see it covers all kinds of good information including what an Administrative Consultant is, the benefits of support, how to choose an Administrative Consultant, and how to work together successfully.